Every day there is work to do on a farm. Plowing and planting, cutting and chopping, lifting and hauling. And for each of these jobs there is a special machine. Years ago, much of the work was done by hand or with the help of horses and simple equipment. Then the first tractors came into use, and they were followed by a parade of amazing machines like skid steers, haybines, combines, grain drills and much more. 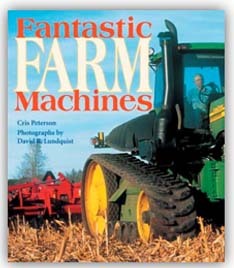 Cris introduces readers to twelve big pieces of farm machinery that help get the job done. There are sprayers that look like huge prehistoric birds and skid steers with buckets for lifting every imaginable thing. In his first book with Cris, internationally renowned photograph David Lundquist shows each piece of equipment in eye-popping vibrant color and vivid detail.